Only 270 km north of Maputo or 70 km north of Xai-Xai and 5 km from the main road you can experience the magic of the Mozambican coastline at this small coastal paradise called Paraiso de Chidenguele. The Indian Ocean meets land at one very special place in Mozambique. Here its azure waters are home to whales, dolphins and turtles while predatory game fish prowl colorful reefs below. Fishing is great and many fishermen have met their match in the unexploited waters of Paraiso de Chidenguele - this is kingfish country. Ski boaters have access to a surf launch site and can look forward to excellent game fish catches. Snorkeling is wonderful at low tide, even for the less confident or inexperienced - perfect for beginners or children. Explore the numerous, magnificent rock pools, shallows and gullies teeming with sea life and marvel at the incredible diversity of shape, form and color in the underwater world. 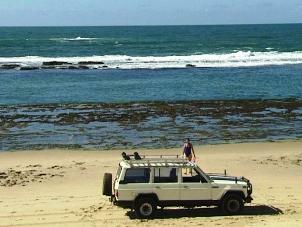 You can take a beach trip to the renowned pools of King Gungundwana for fishing, bathing and snorkeling. A ship, which ran aground in 2000, lies high and dry just a short distance from the lodge, beyond King's Pool. Experience the beauty of the Worldview view-site. From the top of one of the highest dunes in the area and with the Indian Ocean at your back, the inland view over unspoiled Mozambique is spectacular and unforgettable - the epitome of tranquility. The Boa Paz lighthouse that is still active and in nightly use is a wonderful backdrop for spectacular sunsets. The bar at Paraiso de Chidenguele is legendary, well stocked with a stunning ocean view and open daily till late. This is where it all happens, washing down hot, fried cashew nuts with a frosty Laurentina or 2M beer. Fabulous seafood meals and pizzas are served on request. 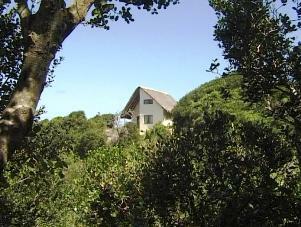 The resort offers neat self-catering, thatched chalets with timber decks. Each chalet sleeps 4, 6 or 8 people. They are sea facing, isolated from one another and tucked into indigenous forest. The chalets are serviced daily and have hot and cold running water, fully equipped kitchens and bathrooms with shower, toilet and basin. The resort also boasts overnight units that are a perfect night stop for the weary traveller.